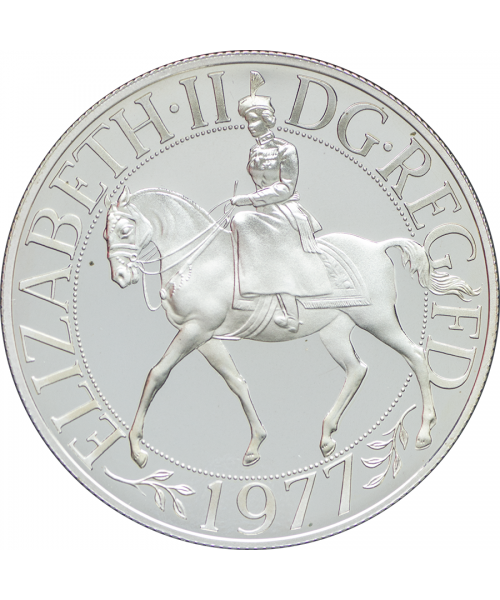 To mark the 25th anniversary of Queen Elizabeth II’s accession to the throne, the Royal Mint issued this 1977 Jubilee Crown Coin. 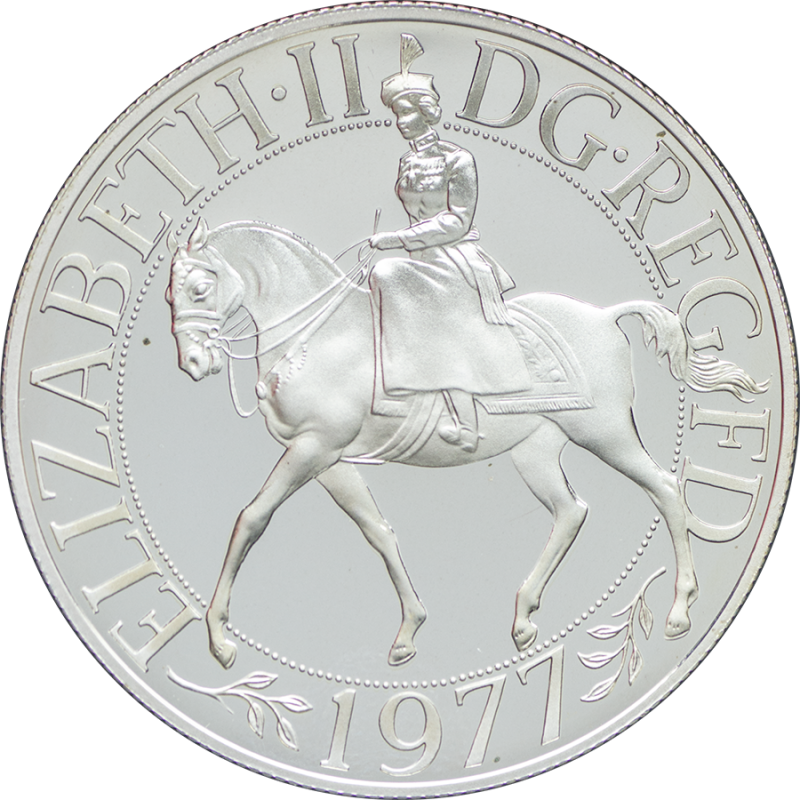 Featuring artwork by British coin designer Arnold Machin, the 1977 Silver Jubilee Crown Coin includes an equestrian portrait view of Her Majesty Queen Elizabeth II on horseback on the obverse – not dissimilar to the 1953 Coronation crown. The reverse boasts the floral garland, the ampulla and anointing spoon, with the unusual feature of having no inscription of any kind. With a face value of twenty-five pence, this coin was issued without a mark of value since it was intended as a commemorative coin rather than one intended for circulation. 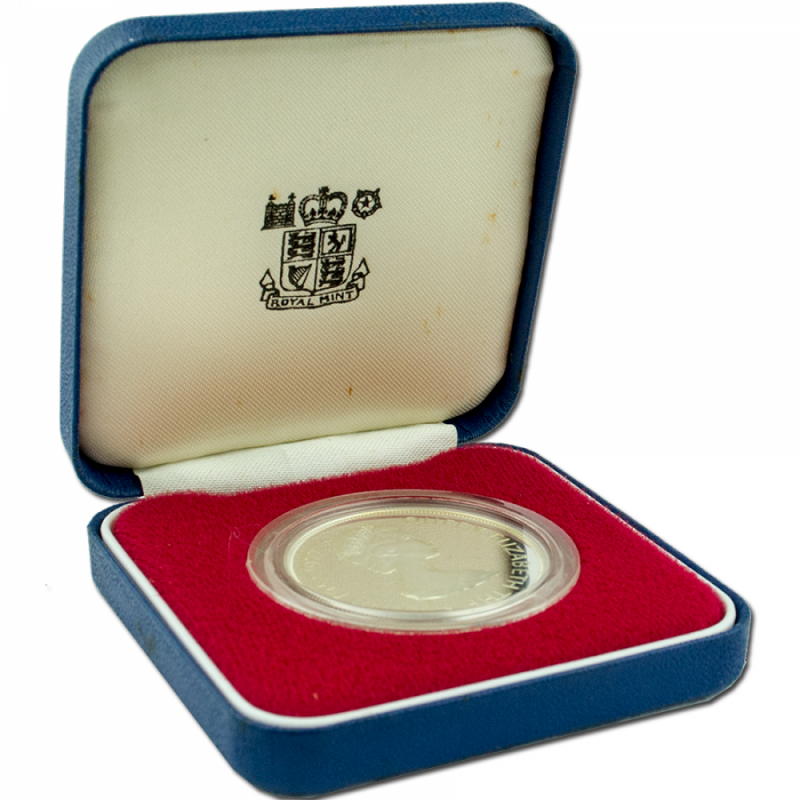 Presented in an original Royal Mint blue case, complete with certificate of authenticity, making this a silver jubilee coin worth collecting. The Silver Jubilee of Her Majesty Queen Elizabeth II. The Jubilee celebrations saw large parties and parades throughout the UK and Commonwealth throughout 1977, concluding with the official Jubilee Days in June to coincide with the Queen’s official birthday. To mark the momentous anniversary, the Queen and Prince Phillip embarked on an epic 3-month long visit across the UK that covered 36 counties. This was followed by a Commonwealth visit later that summer which covered amongst others, New Zealand, Australia, Papua New Guinea, the West Indies and Canada. To complete the official celebratory Jubilee Days on June 9th, the Queen made a Royal Progress trip via boat on River Thames from Greenwich down to Lambeth in a commemorative re-enactment of the famous progression taken by Queen Elizabeth I. A firework display, procession of light carriages and appearance by the Queen on her balcony concluded celebrations. As well as this collectable Jubilee Crown Coin, there are many other legacies from the anniversary celebrations. The Jubilee Line on the London Underground was still under construction and was originally destined to become the Fleet Line but was given the silver colour and name to honour the event, though the line didn’t open until 1979. The Jubilee Gardens in South Bank and the Silver Jubilee Walkway were named in commemoration and the Silver Jubilee Bridge Merseyside was renamed in honour of the celebration. Tower Bridge was also repainted in a red, white and blue colour scheme and has carried the colours to this day. 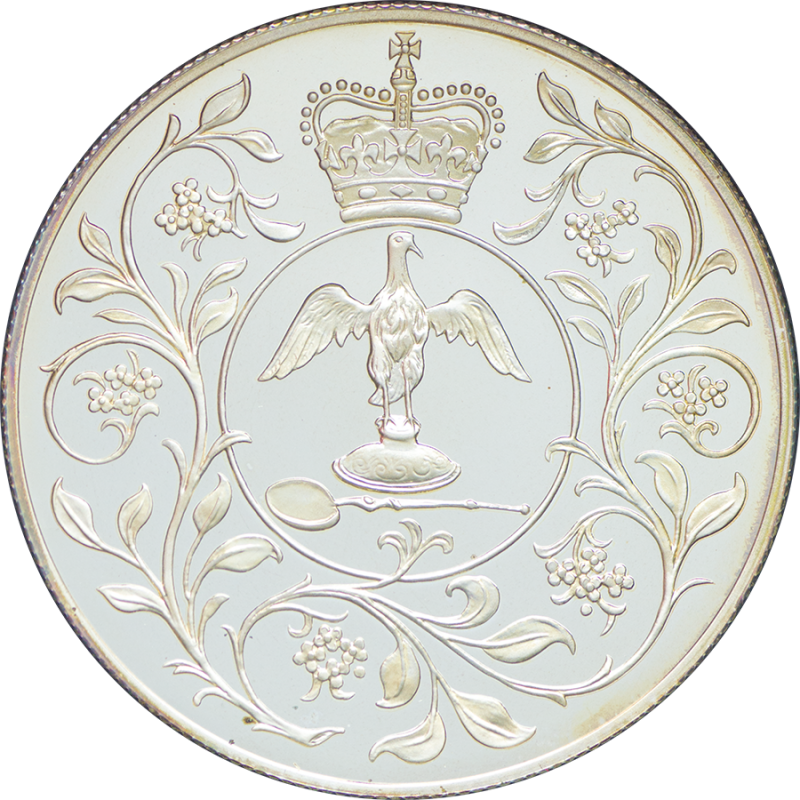 We offer similar examples such as the 1977 queen silver jubilee medal and the Coronation crown. These coins continue to be very popular with our collectors in the United Kingdom.